Oils in general help to lubricate the hair (notice I didn’t say moisturize). I’ve even read articles about mineral oil being helpful. However, I refrain from it because it does my hair no good whatsoever. Olive and Jamaican Black Castor Oil (JBCO) for scalp massages. JBCO is also used to seal my ends. Strong Roots Red Pimento Oil – I’m newly using this to see if it helps with my itchy scalp. 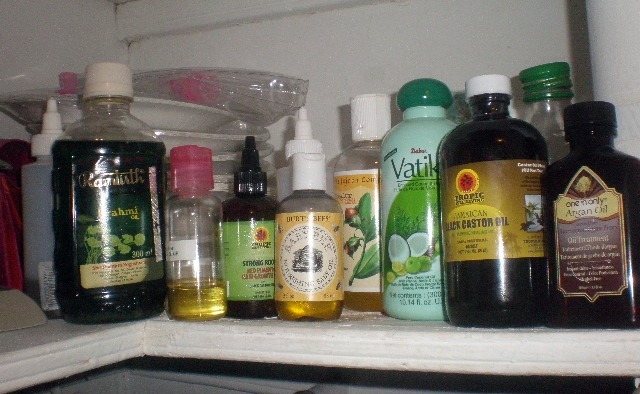 What natural oils do you use on your hair? If you don’t use oil, will you plan to after reading this post? Natural plant as home remedy for hair treatment is very essential to promote hair volume and re growth healthy hair as well. Using jojoba oil is very effective and safe. I agree. I love jojoba oil! I used to use Carol’s Daughter hair elixir but I realized that I could pretty much make my own. I bought some sweet almond oil and mixed it with grapeseed oil, jojoba oil, and a little neem oil. I added essential oils to my mixture. I love it. good for you. I’m not a DIY gal! Wow! so many oils! Yet another insightful post. I use extra virgin olive oil for everything & it works well for me. Thanks for sharing. Hi Max-E. Thanks! I like olive oil too. You gotta try some Vatika coconut oil though. It’s wonderful for pre-pooing. I just starting using it like a month ago. Nice oil selections. Love the Carol’s Daughter hair elixer, argan oil Shikaki Cocasta oil, ojon serum, Carol’s Daughter Tui oil, Kiehl’s Eucalyptus and Argan oil, Jojoba oil, Avocado oil, Macadamia nut oil, Grape seed oil and I have a few more that I alternate with. The dermatologist had said it was sebaceous dermatitis, but I have my doubts. Stress tends to activate it, and even now (ironically, since I sprayed with the concoction), it’s acting up again. If I use Oyin juices, I’m fine; also Uncle Funky’s Daughter and Just Natural’s moisture pomade. Might be the glycerin or the castor oil in my case. It’s trial and error, Michelle. Even the “experts” (dermatologists, naturopaths) can’t work it out sometimes. Sounds like a case for Doctor Jesus! Actually I do have JBCO and I’ve been meaning to use it more. I used to use it with a dropper on my scalp with rosemary oil. I may have to go back to it! Be careful using JBCO on the scalp. Some have reportedly experienced a lot of itching. I just use it to seal my ends but I got my Strong Roots Red Pimento Oil and used it yesterday. Too soon to tell if it will cure my itchies because I was still itching lol. If it doesn’t help the itching, then I recommend highly two products at http://www.justnaturalskincare.com/. They are their Itchy Scalp Treatment and their Scalp Fungus Itchy Scalp treatment. The ingredients are all natural and organic and they use tea tree oil, which immediately stops the itch. Believe me, I had it real bad last year and this was the only thing that worked! oooh thanks for sharing. i may just get it anyway because i hate this itching. i don’t have any scabs or redness or flaking. just itching. usually moreso after i wash my hair. going to the site now thanks! That’s how I was too… no scabs, no flaking, just fierce itching and burning like when you just finished getting your hair relaxed. These guys’ products are a little pricey, but they’re worth the $$$. They give instant relief. I keep some in my bag so that if I have an itchy spell at work, I can deal with it there. I also use several other products by Just Natural. Re: the JBCO, I think I didn’t use enough to see any results, good or bad. Actually, tonight I just added some to my spray concoction (water, glycerin, JBCO, and a few drops of lavender). We’ll see how that works! but I wonder what’s causing the itching. That’s the crazy thing. Even if instant relief is provided, it’s like taking medicine but not knowing a cause. I want to get to the bottom of why my scalp itches so much. I wonder if it’s parasites. I’m going to see my alternative health doctor soon. OOooo very informative. I grew up married to mineral oils lol But we divorced last year. Best decision for my hair. I love oils. I want to venture out and use more oils. Thanks for these suggestions! LOL Leah, I think we all grew up with mineral oils. Either that or grease! 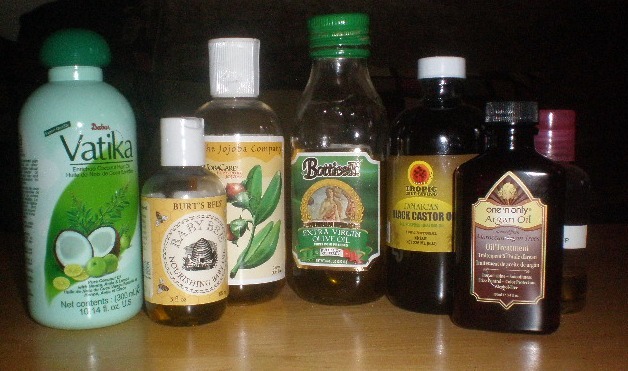 I use castor oil in my deep conditioner, as it tends to add moisture and leave the hair softer. I’m interested in the Burt’s Bees and Argan Oil! May well try them out next (yes, I’m a PJ!). I didn’t have much success with Lisa’s Elixir, as much as I loved the smell. Hey alison, are you useing the Jamaican Black Castor Oil or the regular? If you aren’t using the JBCO, come on fellow PJ. Jump on the band wagon! LOL. It’s really wonderful and way different than regular castor oil. You see that big bottle I got lol. Always wanted to try out hair oil but there’s just so many to choose from! There are but you can narrow them down based on what you are looking to accomplish for your hair. Many ladies just stick with coconut oil. It’s a great pre-poo but I find it makes the hair crunchy if you use it on wet hair.